I am happy to announce I will be speaking at The MicroCap Conference in Toronto, April 11-12. This conference will be a great opportunity to network, hear presentations from many promising small companies outside the natural resources sector and to meet with management. The Canadian market is a rich hunting ground for quality microcap companies, many of which have seen their share prices unfairly punished by the turmoil in the oil and gas industries. Best of all, this conference is free to attend! Blog subscribers are eligible for a special rate on rooms at the Toronto Hilton, plus half off the price of tickets for the investors’ dinner on the 11th. I’ll be e-mailing the details to blog subscribers in a few days, so please be sure to subscribe to OTC Adventures by then if you would like to be included in the mailing. I really enjoyed meeting many blog readers at the last conference in Philadelphia. Please let me know if you will be attending the Toronto conference and we can grab coffee or a beer. While on the topic of Canada, I’d like to present an interesting merger arbitrage opportunity in a very obscure income fund. For the next few years, Dominion Citrus Limited operated as an ordinary corporation. The company issued Series A Preferred Stock in 2002 to help finance the acquisition of a subsidiary. In 2006, the company merged with the newly-created Dominion Citrus Income Fund. Under Canadian law at the time, income funds were exempt from corporate taxation as long as they paid out substantially all their earnings to shareholders, much like a REIT. The income fund acquired all of Dominion Citrus Limited’s common shares in exchange for fund units. The fund did not acquire Dominion Citrus Limited’s preferred shares. The fund intended to do so, but the necessary shareholder vote failed. So, the preferred shares remained outstanding, an unusual feature for an income trust. Most critically, the transaction created a substantial amount of inter-company debt owed by the operating company to the fund. Dominion Citrus Limited now owed the fund $19.3 million in participating notes due in 2016 at effective interest rates as high as 18.5%. Changes to Canadian law soon made the income trust legal structure unattractive, so in 2008 the fund decided to convert back into a corporation. Throughout the 2000s, Dominion undertook a variety of small acquisitions and marketing efforts in an attempt to grow its sales and earnings, but nothing ever really worked for long. Revenues and profits entered a long slow decline and in 2009, the fund and the operating company restructured the participating notes. The base rate on the notes was cut to 5%, but the notes still contained provisions that could require the operating company to surrender all its pre-tax income to the fund as additional interest. Even the restructuring wasn’t enough, and the fund provided an extended interest “holiday” to the operating company, forgoing payment on the participating notes in exchange for an option to purchase the operating company’s main operating asset at fair market value. Things came to a head in 2014. The operating company had not made principal or interest payments to the fund for a number of years, and the fund had long since ceased making dividend payments to unit holders. Holders of the preferred shares had essentially no chance of seeing a dividend, as the terms of the participating notes would shuttle all of Dominion Citrus Limited’s potential earnings to the fund itself. The fund announced it would explore strategic alternatives and made efforts to market the operating company for sale. However, these efforts fell apart as holders of the preferred stock sued over the original terms of the participating notes, arguing the fund had unjustly enriched itself at the expense of the preferred shares. The search for a solution continued throughout 2015. If this all sounds a little byzantine, it is. I’ve created an ownership chart below. 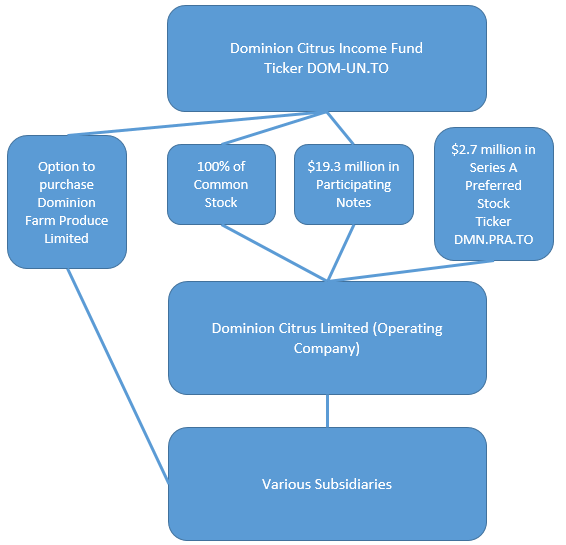 To summarize, the fund itself owns three assets: 100% of Dominion Citrus Limited’s common stock, $19.3 million in intercompany participating notes, and an option to purchase Dominion Citrus Limited’s most substantial subsidiary, Dominion Farm Produce Limited. The fund does not own Dominion Citrus Limited’s preferred stock, which is publically traded. In November of 2015, with the participating notes coming due in just weeks, Dominion Citrus Income Fund indicated it would no longer be willing to excuse its operating company’s lack of payment and indicated it would exercise its option to purchase Dominion Farm Produce Limited. The fund commissioned a valuation company to prepare a valuation report for the subsidiary. Klein Farber’s report valued Dominion Farm produce at between $7.9 and $9.8 million, and the whole of Dominion Citrus Limited at between $10.3 and $13.5 million. Of course, the fund never really intended to purchase the subsidiary, as it would essentially just be paying itself and reducing the balance of the participating notes. The purpose of the exercise was to establish a valuation for a third party to purchase the fund’s entire asset base, participating notes, option to purchase and all. The fund found its purchaser in Paul Scarafile, the interim CEO of Dominion Citrus Limited. Mr. Scarafile offered $10.8 million for all of the fund’s assets. This works out to CAD $0.51 per fund unit. Because the offer price falls within the valuation range produced by Klein Farber, the fund’s board has recommended the offer to unitholders. The fund itself has no material liabilities. Should the offer go through, fund owners could realize a large gain. Fund units are currently offered at CAD $0.37, with a wide bid/ask of $0.25/$0.37. 51 cents per fund unit would represent a gain of 38% from the ask price. However, there are several uncertainties. The press release describing the offer indicated that the offer is not entirely cash, so the fund may end up owning risky promissory notes. Also, the offer itself is conditional and includes financing and due diligence contingencies. Even if the transaction goes off without a hitch, the fund may incur substantial costs during its wind-down, including additional litigation from the holders of the preferred stock. There may be an opportunity here for aggressive investors, but caution is necessary. Personally, I am always sad to see one of the truly strange companies of the microcap world disappear. Alluvial Capital Management, LLC does not hold shares of Dominion Citrus Income Fund or Dominion Citrus Limited Series A Preferred Stock for the accounts of clients or principals. Alluvial may buy or sell shares of Dominion Citrus Income Fund or Dominion Citrus Limited Series A Preferred Stock at any time. Any idea how the preferred shares would be treated in the event of a change of control? I know from past experience that preferred shares are often not treated fairly in takeovers. There doesn’t appear to be a specific provision for change of control in the amendment to the articles of incorporation. The preferred shares were issued as part the consideration for the takeover of a company called Humpty Dumpty Snack Foods Inc. and appear to have few rights. No matter how the deal shakes out, things don’t look good for the preferred share holders. In fact, the preferreds were already supposed to be redeemed but haven’t been because legally, Dominion Citrus Limited can’t. Redeeming the preferred would leave the company in a negative equity position. The best hope for the preferreds is a legal ruling that the participation notes previously issued to the income fund were illegally structured. A truly strange company indeed. Are these preferreds very illiquid?